​After many hours of research, and after evaluating most of the above ground swimming pool covers on the market, we recommend the Blue Wave Bronze 8-Year Round Above Ground Pool Winter Cover (link is to the 12 foot model, however it’s available in various sizes up to 30 foot). This pool cover carries an 8-year manufacturer’s warranty, and is perfect to protect your pool against the winter weather. You could certainly pay more, either for another brand or a different model from Blue Wave, but in our opinion, you don’t need to. The model we’ve chosen is a mid-range item that shares many features with covers carrying a higher price tag (e.g. metal grommets). 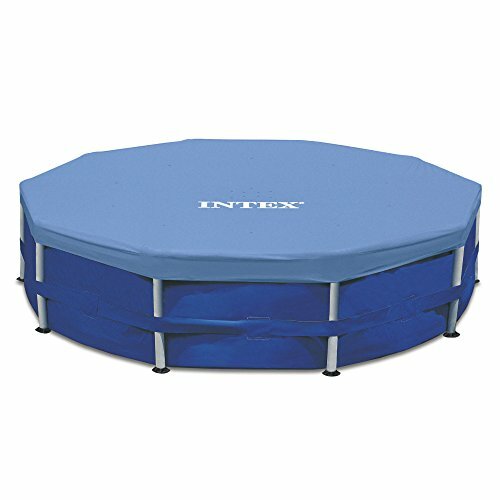 Should the Blue Wave Cover be unavailable, you may like to consider the Intex Metal Frame Pool Cove﻿r. Intex is a big name in outdoor pools, however in our experience the Blue Wave covers are of slightly better quality, and are likely to last longer in practice. 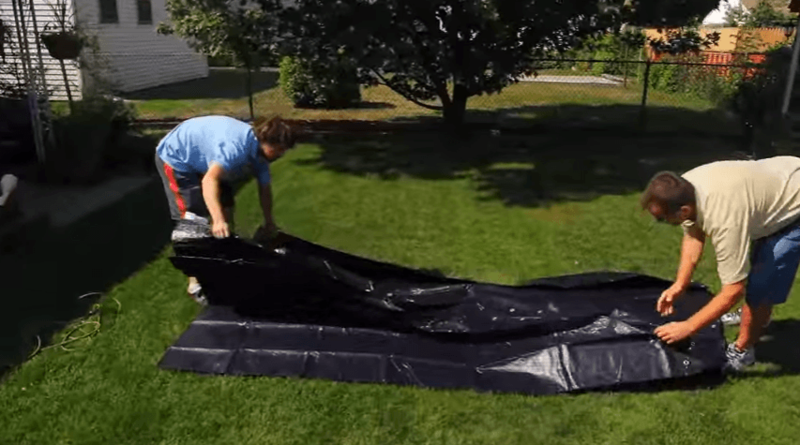 What Makes A Good Swimming Pool Cover? After many hours of research, we're recommending a durable and easy-to-install Blue Wave Bronze 8-Year Round Above Ground Pool Winter Cover. It has most of the features of the pricier models - UV protected topside to last as long as possible in the sunlight, black underside to inhibit the development of algae and bacteria, metal grommets with extra stitching, and a generous 4-ft overlap, so you don’t have problems with stretching and tearing. The material is of reasonable quality and weave (similar to a tarpaulin). The cover comes with a heavy-duty cable and winch tightener, so you can attach it securely to your pool. This model is our choice because it gives you everything you require in a pool cover at the best price you can find. 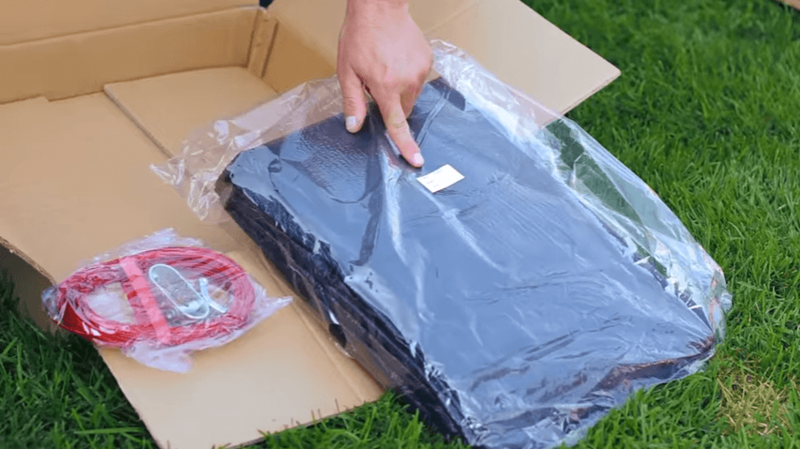 The cover is simple to use and easy to store when not in use, made of durable materials, and the company backs its products if anything goes wrong. The warranty on this one lasts 8 years. There are other covers available (at greater expense) with longer-term warranties, however our expert sources question the value of a 20-year warranty on a pool cover, when the pool itself is unlikely to last this long. There doesn’t seem to be a significant difference in the quality of materials and workmanship between the Bronze range with its 8-year warranty, and the more expensive covers from the same manufacturer. Make sure when ordering your pool cover, to order based on the size required for your pool: e.g. 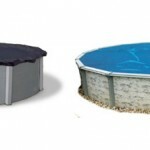 a 20-foot diameter pool requires a cover with a 24-foot diameter. The 8-year warranty is a bit of a sales gimmick in our opinion – the amount of credit the manufacturer offers is further reduced by the fact you have to pay shipping to return the old cover if you’re making a warranty claim. The reality is that these covers will be exposed to harsh outdoor conditions, which will vary hugely between different states, and it’s not possible to make a pool cover at an affordable price point which will survive 100% of all possible conditions for 8,10,15 or 20 years. Our advice is to buy a decent quality cover, use it according to the manufacturer’s instructions, store it carefully in a cool, dry place when it’s not being used, and get as many years use out of it as you can. If you live in an area with harsh winter weather, 2-3 seasons is as much as you can expect from any cover. In our experience, spending the extra money for a supposedly more durable cover may get you an extra season at best. 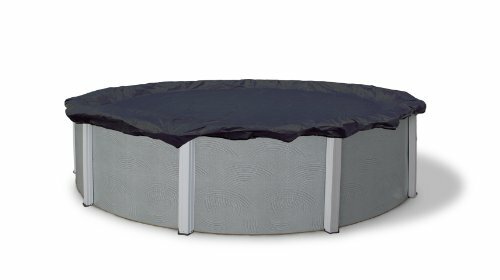 If you are on a tight budget, you could consider the Intex Ro﻿und Pool Cover – this will provide the basic function of sheltering your pool from leaves and debris, though there are question marks over its long-term durability. Unlike the Blue Wave and similar covers, this cover doesn’t lie on the surface of the water, rather it is flush with the top side of the pool (picture a drum). If you want something a bit more substantial and potentially more durable, have a look at the Blue Wave Gold 15-Year Round Above Ground Pool Winter Cover. The manufacturer states this cover is made of their most durable materials, and is designed to cope with a harsh Minnesota winter. The price is approximately double that of the equivalent Bronze cover. The material is heavier, making handling, cleaning and storing more of a chore. -Tight weave: The tighter the weave of the material, the more leaves and debris will be kept out of your pool over the winter. -Size: the cover should be at least 3-ft larger than the pool, which allows the cover to drop down below the top of the pool sides, and sit on the surface of the water. If the cover is too small, you will stretch it when putting it on the pool, which will considerably reduce the life of your cover. -Metal grommets, preferably stainless steel, with extra stitching around the grommets – this will reduce the wear and tear on the mounting holes around the edge of the cover. We have seen covers with no grommets at all, which should be avoided, as the cover will quickly tear at this area of maximum strain. -Dark color: the underside of the cover should be a dark colour, which restricts the amount of light passing through the cover, and inhibits the growth of algae and bacteria. With our experts’ selection criteria in mind, we searched through pool cover reviews on websites such as Amazon, Home Depot, Target and Walmart, to see how users liked different makes and models of cover. For anything larger than about a 12-foot pool you'll need someone to help. Now you turn the winch handle, to tension the cable. When the cable is taut it will hold the cover tightly to the pool. 1. Using milk jugs, concrete blocks, or other weighing-down devices not included with the cover or approved by the manufacturer. These can cause excess strain on certain areas of the cover that it is not designed to cope with, and lead to premature wearing or tearing of the cover. 2. 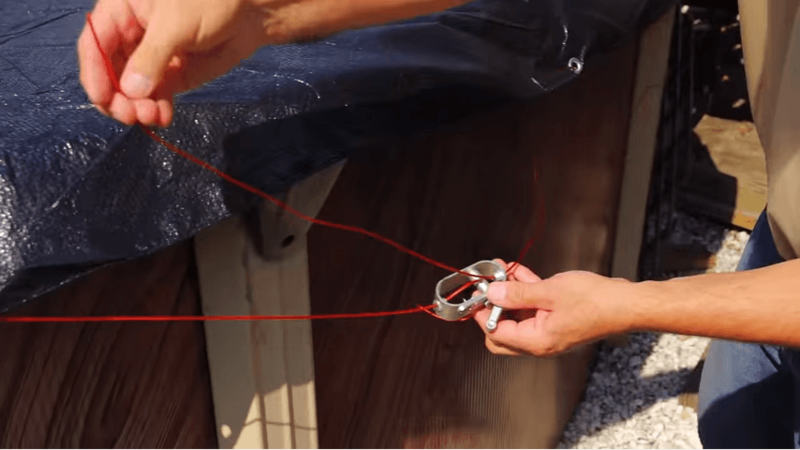 Allowing the cover to become snagged or pinched on sharp areas of your pool - for example, if your pool has any sharp areas on the top rail, once the cable is tensioned, the sharp areas will chafe at the cover, potentially causing it to fail. Poolcenter.com has some additional tips on how to remove, clean, fold and store the cover. There were no recalls listed for any of the <x> mentioned here at the time of writing (<x>). However, it's always a good idea to check the latest information at the Consumer Product Safety Commission website before buying any large, expensive or potentially dangerous product. 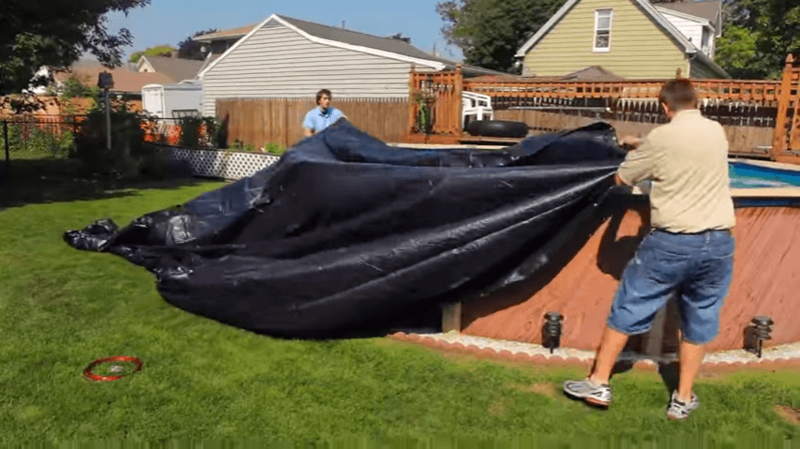 Do you own any of the pool covers mentioned here? Did you choose a different one? Let us know in the comments!